Dr. Mike Barrett is passionate about dentistry and his responsibility to provide his patients with the best dental care. Dr. Mike’s dad, Dr. Dan Barrett, greatly influenced his decision to go into the field of dentistry. When Dr. Mike bumped a front tooth as a teenager, he ended up needing a root canal, which his dad performed. As part of the procedure, his dad gave him an injection and Dr. Mike didn't even know! The whole process was so easy and painless that it left a lasting impression on him. Since almost half of the population fears going to the dentist, Dr. Mike is dedicated to providing others with the same gentle care he received from his dad. Dr. Mike had the opportunity to work alongside his dad for two years—before he retired in 2016—and tries to emulate his dad’s gentle technique and kind disposition. Dr. Mike grew up in Whatcom County. After graduating from Meridian High School, he attended Brigham Young University. 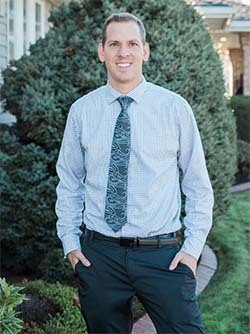 Dr. Mike then completed his dental training at the University of Nevada Las Vegas School of Dental Medicine, graduating in 2014 near the top of his class. He is professionally affiliated with the American Dental Association, the Washington State Dental Association, and the Mount Baker District Dental Society. In 2017, he became certified in oral sedation—offering patients with dental anxiety a stress-free dental experience. 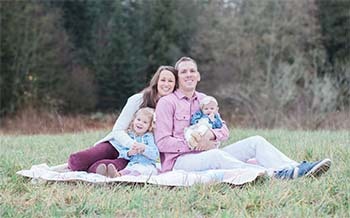 Dr. Mike and his wife, Mica, are the proud parents of two daughters, Sadie and Piper. They love the outdoors and especially enjoy riding bikes, going to the park, and hiking.